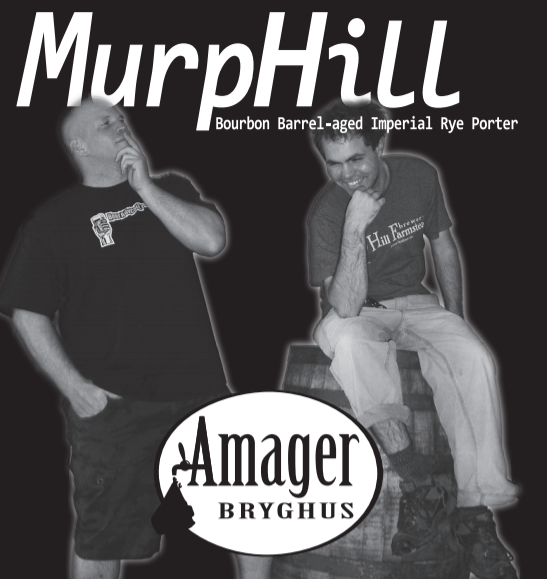 “Amager Bryghus has come a long way since our start in 2007, and along this way we have met and worked with a lot of great people. Two of those we would like to pay homage to by re-brewing a beer we originally did with them back in 2012. Mike Murphy and Shaun Hill were then both brewers in Copenhagen, and as we are indeed very much inspired by modern American craft brewing it was meant to happen that we would become friends and hang out at each other’s breweries. At such a get-together we came up with the recipe for our Imperial Rye Porter (Rugporter), a beer we still brew occasionally. And a beer we found fitting to put on Bourbon barrels back them. Mike and Shaun have indeed since come up in the craft beer world – to say the least – and in out anniversary year we found it only fitting to recreate the beer we named after these two craft beer pioneers on the Danish brewery scene.